Räume und Dinge speichern in sich die Präsenz der Menschen. Denn die Körper drücken sich in den Mauern ab, zwischen denen sie leben, an denen sie entlang gehen. So betrachtet, lässt sich die Landschaft lesen als eine Topographie unsichtbarer Schichten, die die Menschen darin hinterlassen. Doch was wäre, wenn man nach den Spuren fragt, die Räume und Dinge den Menschen ihrerseits einprägen? Dann bringen die Mauern erst die Körper hervor, die sie einst geschaffen haben, und die Dinge formen die Menschen, die sich mit ihnen befassen. Das Kunst- und Wissenschaftsprojekt Corpus Intra Muros widmet sich der Beziehung zwischen Räumen, Körpern und Dingen. 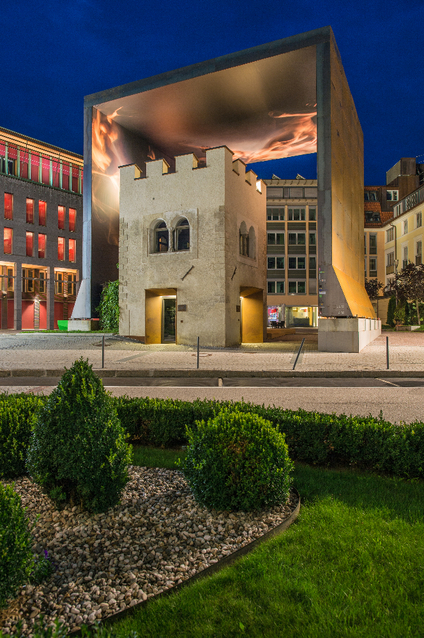 Ausgangspunkt ist der so genannte Pulverturm in Bruneck im Südtiroler Pustertal. Der Turm ist ein Nicht-Ort, denn anders als viele historische Gebäude besitzt dieser Turm keine eigene Identität, keine überlieferte Geschichte, nur viele Erzählungen, die sich um ihn ranken. Der Turm wird zum Medium einer zweifachen Auseinandersetzung mit der Beziehung zwischen Mensch & Mauer: Einmal lässt eine architektonische Konstruktion menschliche Körper, in fotografischen Darstellungen festgehalten und großformatig aufgebracht auf ein Trägermaterial, mit dem Turm verschmelzen. Daneben begibt sich eine wissenschaftliche Spurensuche auf die Fährte von Körpern und ihren Dingen in den Räumen. Kunst und Wissenschaft lassen die Grenze zwischen Mensch und Materie unsicher werden, bis sie sich ganz ins Erzählerische verschiebt. Spazi e oggetti trattengono in sé la presenza umana. I corpi si imprimono nelle mura fra le quali vivono, lungo le quali camminano. Sotto questo aspetto il paesaggio può essere letto come una topografia di strati invisibili che gli uomini vi hanno depositato. Ma cosa accade se si interrogano le tracce che spazi e oggetti imprimono a loro volta negli uomini? Allora le mura creano gli uomini che un tempo le realizzarono, e gli oggetti plasmano le persone che hanno a che fare con essi. Il progetto artistico e scientifico Corpus Intra Muros è dedicato al rapporto fra spazi, corpi e oggetti. Il suo punto di partenza è la cosiddetta “torre polveriera” a Brunico, in val Pusteria. Quella torre è un non-luogo, poiché a differenza di molti edifici storici non ha una propria identità, non una storia tramandata, soltanto molti racconti che vi si riferiscono. La torre diviene il mezzo per un duplice approfondimento della relazione fra uomo e muro: per un verso la costruzione architettonica porta i corpi umani, fissati in rappresentazioni fotografiche e presentati in grande formato su un supporto materiale, a fondersi con la torre. Accanto a ciò, la ricerca scientifica si mette sulle tracce dei corpi e dei loro oggetti negli spazi. Arte e scienza rendono incerto il confine fra uomo e materia, fino a favorirne lo slittamento in una dimensione narrativa. Spaces and objects contain within them the presence of human beings. Human bodies imprint themselves on the very walls between which they live and along which they walk. Landscape can thus be read as a topography of invisible layers left behind by humans. So what would happen if we were to inquire after those human traces spaces and objects leave in human beings. The walls would influence the human bodies that had once created them, and the objects form the people who used them. 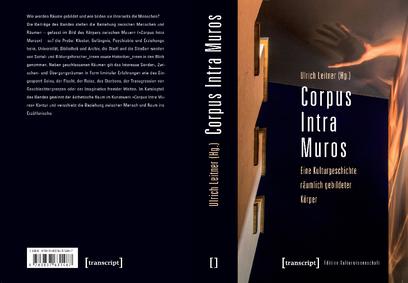 The Art and Science Project Corpus Intra Muros is dedicated to the relationship between spaces, bodies and objects. Its point of departure is the building known as ‘the gunpowder tower’ in Bruneck, in South Tyrol’s Puster Valley. The tower is what we might call a ‘non-place’, because, unlike many other historical buildings, it has no identity of its own; none of its history has been passed down to us, only a number of stories that are associated with it. 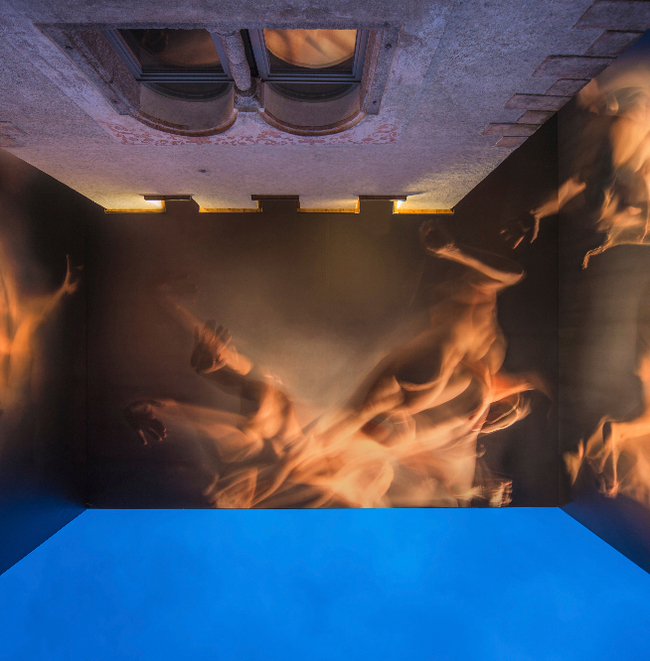 The tower has become the conduit of a two-sided exploration of the relationship between the human being & the wall: on the one hand an architectural structure permits the merging of human beings with the tower, captured as they are in photographic representations and blown up into a large format on a substrate. Simultaneously, a scientific search is being undertaken to detect the traces of the trails of bodies and their objects in the given spaces. Art and science thus blur the boundaries between human beings and matter, to the point of shifting it completely into the narrative form. Wir danken den Fördergebern des Projektes: der Raiffeisenkasse Bruneck, der Stadtgemeinde Bruneck, dem Stadtmarketing Bruneck, der Autonomen Provinz Bozen-Südtirol, Abteilung Deutsche Kultur und den Firmen, die für die Umsetzung des Kunstobjektes verantwortlich zeichnen. Ringraziamo i finanziatori del progetto: la cassa Raiffeisen di Brunico, la Città di Brunico, il Marketing Città di Brunico, la Provincia Autonoma di Bolzano - Alto Adige - Ripartizione Cultura tedesca e le aziende responsabili della realizzazione dell’opera artistica. 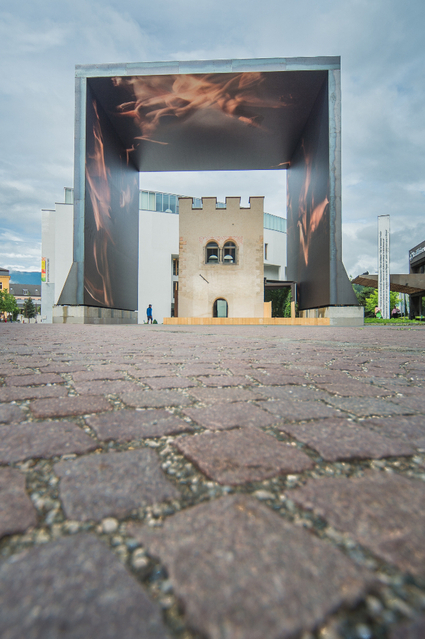 We would like to express our thanks to the spon­sors of this project: the Raiffeisen Savings Bank, the borough of Bruneck, the market­ing arm of the town of Bruneck, the Autonomous Province of Bolzano – South Tyrol – German Culture and the companies responsible for the implementation of the works of art.